Galaxies, it seems, are sociable animals and they like to gather together in large groups, known as clusters. Actually it’s gravity that holds the galaxies in the cluster close together as a single entity, with the pull of gravity arising from large amounts of dark matter, as well as from the galaxies we can see. Clusters can contain anything between about 100 and 1000 galaxies and can be between about 5 and 30 million light-years across. Galaxy clusters do not come in neatly defined shapes so it is difficult to determine exactly where they begin and end. However, astronomers have estimated that the centre of the Fornax Cluster is in the region of 65 million light-years from Earth. What is more accurately known is that it contains nearly sixty large galaxies, and a similar number of smaller dwarf galaxies. 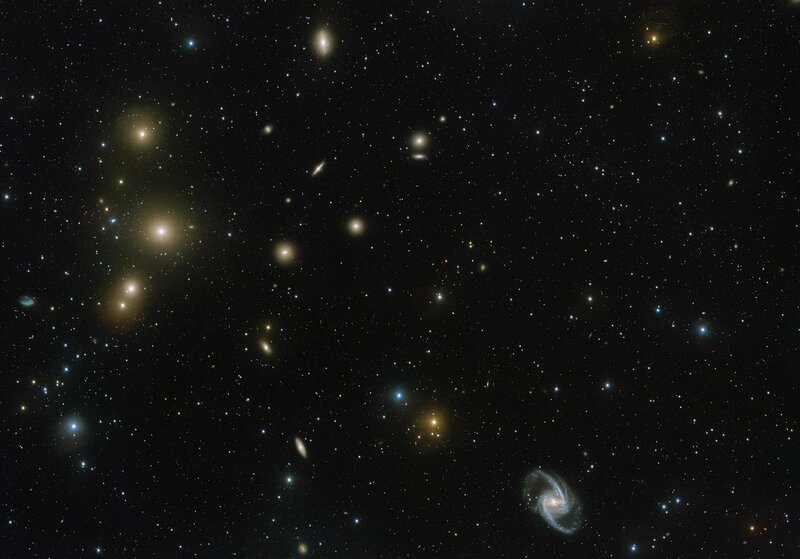 Galaxy clusters like this one are commonplace in the Universe and illustrate the powerful influence of gravity over large distances as it draws together the enormous masses of individual galaxies into one region. At the centre of this particular cluster, in the middle of the three bright fuzzy blobs on the left side of the image, is what is known as a cD galaxy — a galactic cannibal. cD galaxies like this one, called NGC 1399, look similar to elliptical galaxies but are bigger and have extended, faint envelopes . This is because they have grown by swallowing smaller galaxies drawn by gravity towards the centre of the cluster . Indeed, there is evidence that this process is happening before our eyes — if you look closely enough. Recent work by a team of astronomers led by Enrichetta Iodice (INAF – Osservatorio di Capodimonte, Naples, Italy) , using data from ESO’s VST, has revealed a very faint bridge of light between NGC 1399 and the smaller galaxy NGC 1387 to its right. This bridge, which has not been seen before (and is too faint to show up in this picture), is somewhat bluer than either galaxy, indicating that it consists of stars created in gas that was drawn away from NGC 1387 by the gravitational pull of NGC 1399. 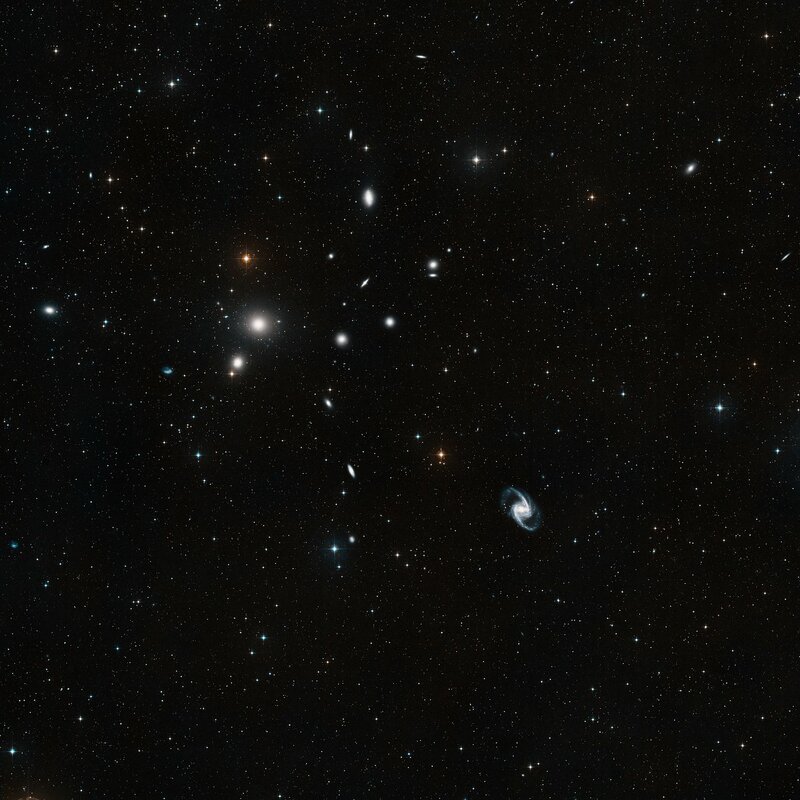 Despite there being little evidence for ongoing interactions in the Fornax Cluster overall, it seems that NGC 1399 at least is still feeding on its neighbours. Towards the bottom right of this image is the large barred spiral galaxy NGC 1365. This is a striking example of its type, the prominent bar passing through the central core of the galaxy, and the spiral arms emerging from the ends of the bar. In keeping with the nature of cluster galaxies, there is more to NGC 1365 than meets the eye. It is classified as a Seyfert Galaxy, with a bright active galactic nucleus also containing a supermassive black hole at its centre. This spectacular image was taken by the VLT Survey Telescope (VST) at ESO’s Paranal Observatory in Chile. At 2.6 metres in diameter, the VST is by no means a large telescope by today’s standards, but it has been designed specifically to conduct large-scale surveys of the sky. What sets it apart is its huge corrected field of view and 256-megapixel camera, called OmegaCAM, which was specially developed for surveying the sky. With this camera the VST can produce deep images of large areas of sky quickly, leaving the really big telescopes — like ESO’s Very Large Telescope (VLT) — to explore the details of individual objects. 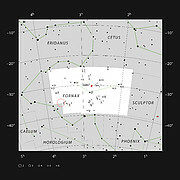 The image captures only the central regions of the Fornax Cluster; it extends over a larger region of sky. The central galaxy is often the brightest galaxy in a cluster, but in this case the brightest galaxy, NGC 1316, is situated at the edge of the cluster, just outside the area covered by this image. 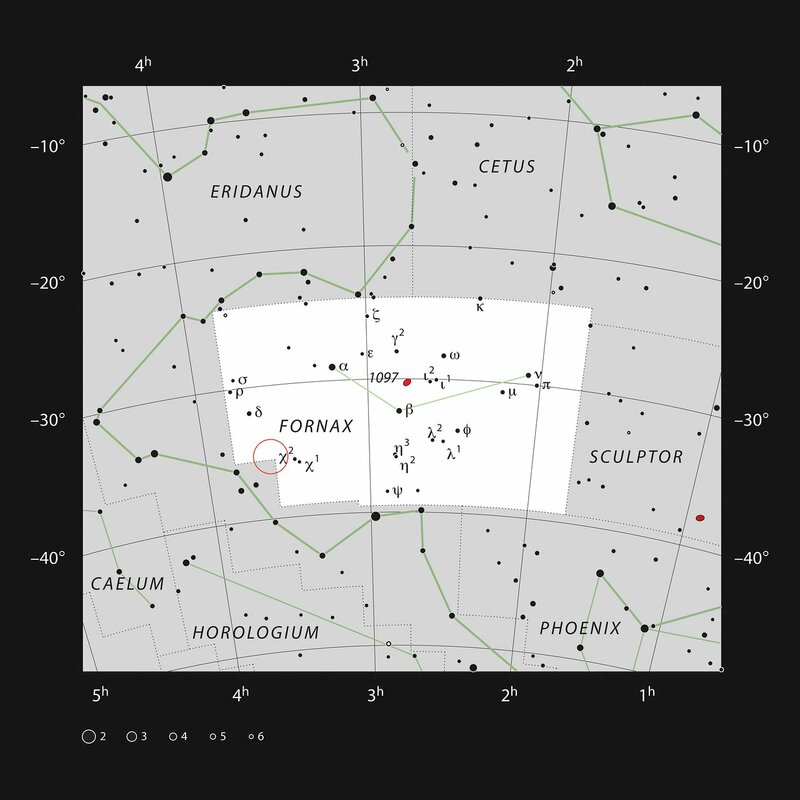 Also known as Fornax A, it is one of the most powerful sources of radio waves in the sky. The radio waves, which can be seen by specialised telescopes sensitive to this kind of radiation, emanate from two enormous lobes extending far into space either side of the visible galaxy. The energy that powers the radio emission comes from a supermassive black hole lurking at the centre of the galaxy which is emitting two opposing jets of high-energy particles. These jets produce the radio waves when they plough into the rarefied gas which occupies the space between galaxies in the cluster. “The Fornax Deep Survey with VST. I. The extended and diffuse stellar halo of NGC1399 out to 192 kpc” by E. Iodice, M. Capaccioli , A. Grado , L. Limatola, M. Spavone, N.R. 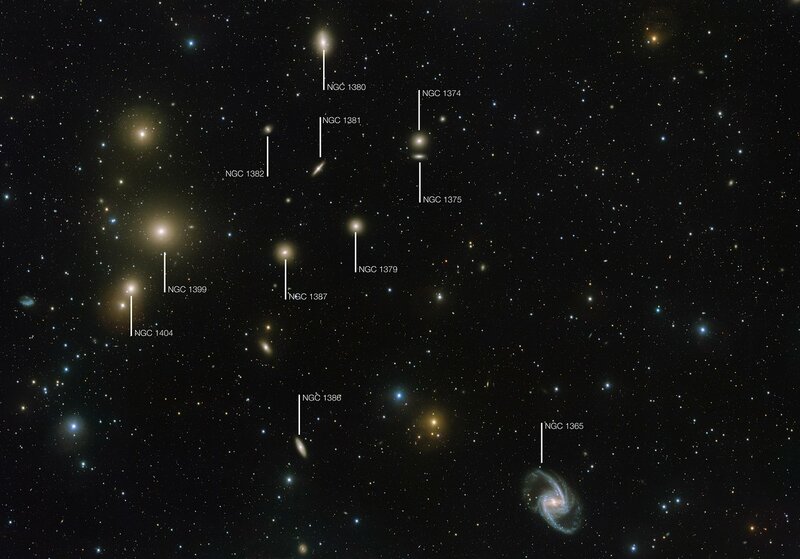 Napolitano, M. Paolillo, R. F. Peletier, M. Cantiello, T. Lisker, C. Wittmann, A. Venhola , M. Hilker , R. D’Abrusco, V. Pota, and P. Schipani has been published in the Astrophysical Journal.